Today I have a super sweet pattern for you to try out. Its not quite as simple as some of my other patterns, but Im hoping it wont be all that hard either. It is a little bonnet that features a ripple and a bobble. It only has a few rows, so instruction wise its easy enough to read. If you use the same materials and rows as I have, it will fit a bub of 36 weeks gestation, but it is very easy to make it larger or smaller. R1: dc in the 4th chain from hook, dc in the next 3 chains *skip 2 chains, dc in the next 4 chains, ch2, dc in the next 4 chains* repeat twice more, skip the next 2 chains, dc in the next 2 chains, 2dc in the next chain and dc in the last chain. R2: ch3 (counts as a dc), skip 1, dc twice in the next stitch, dc in the next 2 stitches *skip 2 stitches, dc in the next 3 stitches, in the ch2 space (bobble, ch2, bobble), dc in the next 3 stitches* repeat twice more, skip 2 stitches, dc in the next 2 stitches, 2dc in the next stitch, dc in the top of the turning chain. Repeat R2 10 more times. Fold your piece in half and sew up the back seam. Turn right way in so seam is on the inside. On one bottom corner join your yarn and ch2, dc evenly along the entire bottom edge of the bonnet until you reach the other corner. ch2, turn, dc in each stitch across, back across the bottom edge. End off and weave in all ends. Today's pattern is a very special one, that was designed with one of my dear friends in mind. Everyone needs a bit of rainbow in their day, and being that here in Aus its wet, cold and all wintery, this is the perfect thing to not only give you some colour pop, but add a little neck warm. Im sure it would look fabulous in other colours also, why not try it! Chain pieces. All pieces are chained with 2 strands of DK weight yarn held together, and using a 6.5mm hook. I chained each colour a slightly different length as I found all the same tended to bunch a lot, and when you have a larger chest, bunching = bad mkay! Also note that I joined my strands after I was done, but you can also join them with a sl st before ending off if you like. Set chains aside while we work on the cloud. repeat row 2 for 6 more rows. End off and leave a long tail for sewing wrap together. Line all the joins in your chains up and use the white wrap piece to encase them. Sew the ends together to form a tube around the chains. If you want to, you can also sew a few times right through one side and out the other, catching the chains in the needle so they are less likely to move. 1. hdc 3 times in the second chain from hook, sl st in the next chain, (hdc, dc, dc, hdc) in the next chain, sl st into the last chain, now working on the opposite side of the chains, sc in all 4 chains. 2. ch1 and turn, (dc, dc, hdc) in the second stitch, sl st, (hdc twice, sl st) in the last. End off leaving a tail to sew to wrap. Attach the cloud to the wrap. Check to make sure all ends are weaved in and thats it, your done! I have another sanitary wallet for you today. Still a few more to come, but I think now Ive covered this area pretty successfully. If you have any requests for more, by all means shoot me an email at myshellecole@gmail.com and Ill do my best! Today's wallet is super easy back and forth stitches and great for using up off bits of yarn. 2: ch2, turn, hdc across. ch2, turn so the next row will be across the ends of the stripes. This neatens the edge and creates a button hole. hdc evenly across the first 2 stripes, ch1 (or 2 if your button is large) and skip the middle stripe, hdc evenly across the last 2 stripes. Fold the wallet as shown below and sew up the sides. Attach button and your done! Another very simple preemie beanie for you today. Not too much different from the last one, but still just as easy and the outcome looks great. This pattern is great for using up leftover variegated yarns in the stripe. ch does not count as a stitch. Join is to the top of the first stitch, not the chain. DK (8ply) yarn in a main and a contrasting colour. Start with a magic ring, alternatively you can ch3 and join to make a loop. R7: ch3, dc in each stitch around, join. Drop contrasting colour and pick main colour back up. R8: ch3, dc in each stitch around, join. Today I have a neat little bag for tampon storage (or for anything else). Something a bit different from the wallets. This little bag features a drawstring and a knit look stitch, and depending on your hook size can hold from 4-8 tampons. I used Carefree. DK (8ply) weight yarn in main colour and a small amount of contrasting colour. R4+: hdc in the 3rd loop (the back back loop) of each stitch around, this pushes the front two loops forward and creates a knit look. Do not join, just continue around until the piece measures 5-6cm long. sl st in the next stitch. R5: ch2, dc in each stitch around, join. In a contrasting colour chain 70. Weave the tie in and out of every second stitch on R5. Another instalment of the sanitary cozies. This one looks a little like a mini handbag (you could always attach handles) and will hold 2 thick pads (or a heap of small ones). It takes a little longer then some of the other ones but its well worth the effort. DK (8ply) yarn in 2 colours for the top flap, and 1 colour for the bag. R2: ch2, dc in the next 2 stitches, ch3, *dc in the next 3 stitches, ch 2* Repeat around, join. R3: sl st in any ch3 space and sc, *ch4, hdc3tg, ch4, sc in the next ch3 space* repeat around ending with a sl st to the first sc. Finish off weaving in all ends. R1: hdc in the 2nd chain from hook and each across to the second last ch, 2hdc in the last chain, then on the opposite side, working in the same chains, hdc in each ch back to the start, join. R9: ch2, *hdc in the next 3 stitches, hdc2tg* Repeat around. Position the doily flap over the top opening so that the centre of the circle is over the centre of the opening. Sew the back side of the flap to the wallet. Leave the other side free. Attach button and your done! Here we go guys, pattern number 3 for the sanitary range! This one is small and cute and will hold 4 regular sized tampons. I used Carefree. R13: ch1, turn, sc blo in the first 3 stitches, ch1, sk1, sc blo in the last 3 stitches. End off, weave in tails. R14: Join contracting colour anywhere on the edge and sl st (or sc) around the opening and flap. Weave in all ends. Add button. I told you Id be back with some more of these. Actually, I have a heap more that Ill spread out over the next week (maybe more) All pretty simple and easy. Hope you enjoy them. Remember that if you have any pattern suggestions, by all means let me know! This wallet will hold 2 thick pads and is the most basic of them all. You can easily adjust the size by making a longer starting chain or by adding more rounds to the height. R1: dc in the 3rd chain from hook and the next 8, dc 3 times in the last stitch, on the opposite side crocheting in the same chains, dc in the next 8 chains, 2dc in the last ch, join. R2-7: ch2, dc in each stitch around, join. R9: sl st 6 (this should be one off the centre back, if not sl st until you are there), ch20, sl st in each remaining stitch back to start. Attach button to the front and your done! It is a rainy horrible cold day here in Tasmania today so to make things a little nicer and brighter, I have a new pattern for you all. This little doll stands around 7 inches tall, hair included and is the perfect size for carting around. Aside from her arms, the rest of her is one piece, which lessens the risk of parts falling off, and makes it easier because seriously, I hate sewing parts on parts! The most important thing to remember with this pattern is to stuff it as you go, and make sure you stuff the neck especially tight (you could even pop a piece of pipe cleaner in there) because once you put the hair on, the head gains a bit of weight. I have instructions for the doll, one wig and a dress. I'll add some more as time allows. Doll is made in continual rounds, place marker to keep track of rounds. PLEASE NOTE: this has NOT been tested. If you run into any mistakes, hiccups or typos by all means email me or leave a comment so I can check it out. Cheers! dk weight yarn in body colour, hair colour and dress colour. sc 2. When pressed flat (eyes facing up) your last stitch should be in the centre, we are going to make legs. (if your stitch is not centred then sc until it is. Finish off, leaving along end. Weave the end in and out of the last 5 stitches and pull tight to close. Tie off and weave in ends. Continue on as for first leg, from R22. End the same as for first leg. Gather the end closed like you did for the legs. Place the arms on the side of the dolls "shoulders" and using the long end from the first arm and a long sewing needle, sew right through the dolls body and out the other side, passing through the second arm. Go back and forth a few times to secure the arms. Finish off and weave in ends. Position the cap on the dolls head so the back sits at the nape of the neck and the top gives a nice hair line. For the pony tail look I simply cut lengths of yarn roughly 13-14 inches long, and taking 2 at a time, looped them through each stitch around the outside edge of the wig cap. Every 3rd one I added a strand of another colour to give the doll streaks in her hair. Then I pulled the hair back into a pony tail, tied it off and trimmed the hair to length. End off and weave in all tails. Add a button to the back. 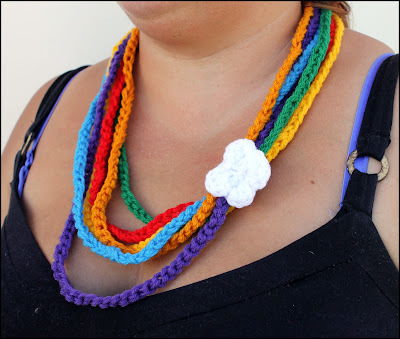 Today I have another pattern for you, that is a simple and easy one to make! It is a tampon wallet. Ok its not as exciting as some other things, but it is cute, handy and useful! I have a few more designs in the works too so keep an eye out for them, as well as some for pads and liners. 3. ch2, hdc in each stitch around, join. ch1, sc in each stitch around, join. 8. Drop contrasting colour and end it off. Pick up main colour. ch2, hdc in each stitch around, join. 12. ch1, turn, sc2tg, hdc2tg, dc in the next, dc and tr in the next stitch, tr and dc in the next stitch, dc in the next stitch, hdc2tg, sc2tg. Attach a button between the 2 contrasting stripes in the middle.